Where did Elvis Presley grow up? Elvis Aaron Presley was born in Tupelo, Mississippi on January 8, 1935. He was the only child of Vernon and Gladys Presley. His family was poor and his father had a tough time holding down a job. For a while, Elvis and his mom lived with his grandmother while his father spent 8 months in prison. Growing up, Elvis was a shy child who was very close to his mother. At a young age, people noticed that Elvis had an excellent singing voice. At the age of ten he gave his first public singing performance. He also got his first guitar that year. Elvis loved playing the guitar. He carried it with him wherever he went, even to school. He never got formal singing or guitar lessons and never learned to read music. He just watched other people play and learned songs by ear (listening to them). When Elvis was in eighth grade, his family moved to Memphis, Tennessee. In Memphis, Elvis was exposed to a wide variety of music. One of his favorite things to do was to go to Charlie's record shop and listen to music. Elvis also continued to practice the guitar. In Memphis there was a recording studio owned by a man named Sam Phillips. Elvis first went to the studio in August of 1953 to record a song for his mom. It was called "My Happiness." Elvis went by Sun Records a lot over the next year hoping to be discovered. At one point Sam Phillips suggested that Elvis get together with a couple of local musicians, guitarist Scotty Moore and bass player Bill Black, to record some songs. Elvis, Scotty, and Bill went to Sun Records and began performing different songs. They played a number of songs, but Sam Phillips was not impressed. He told the boys to take a break. During the break, Elvis began playing an old blues song called "That's All Right". Elvis put his own style into the song. He was singing it fast and dancing around the room. Scotty and Bill heard the music and joined in. Sam Phillips heard the boys playing and knew he had a hit song. He recorded the song, and it was playing on the radio three days later. Elvis was on his way to becoming a star. After "That's All Right" came out, Elvis began to play local clubs and gained a following of fans. Soon Elvis, Scotty, and Bill were traveling around much of the Midwest performing concerts. 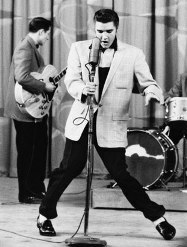 In 1955, Elvis signed a record deal with RCA Records. The album Elvis Presley went number one and also had his first number one hit with "Heartbreak Hotel." Elvis appeared on several TV shows such as the Milton Berle Show, the Ed Sullivan Show, and the Steve Allen Show. He was now one of the biggest stars in music. Elvis had a unique style of music and performance all his own. His music was a combination of country and gospel music. He also danced around on stage shaking his hips. At the time, many adults were shocked by his music and dancing. When he went on TV, he was usually asked not to dance or was filmed from the waist up. Teenagers, however, loved Elvis' music and dancing. They had never seen anything like it and they loved it. In addition to making records and performing concerts, Elvis began to star in movies. His first movie was Love Me Tender in 1956. He also sang the title song from this movie which went number one. Over the next 15 years, he starred in over 30 movies including Jailhouse Rock, Blue Hawaii, Viva Las Vegas, and Double Trouble. Elvis was drafted into the army in 1958. Elvis wanted to be treated like a regular soldier. He served in the army for two years and was released in 1960. During that time, he was part of the 3rd Armored Division in Germany. He was paid like other soldiers, but donated his pay to charity. Elvis continued to make movies and record songs. During the mid-sixties he spent more time on movies and his music career slowed down. He made his big comeback in 1968 with a television special showing him performing various songs. In 1969, he released the album From Elvis in Memphis which contained the number one song "Suspicious Minds." Elvis met his future wife Priscilla while he was stationed with the army in Germany. They dated for seven years before getting married in 1967. Elvis and Priscilla had one child, a daughter named Lisa Marie. Elvis Presley died of heart failure on August 16, 1977. His health had deteriorated over the previous years, largely due to increased weight and drug use. He was buried at Graceland near the graves of his mother and father. Rolling Stone magazine called "That's All Right" the first ever rock-and-roll recording. Elvis bought a mansion outside of Memphis called Graceland. Today Graceland serves as a museum. His daughter Lisa Marie was married to Michael Jackson. He was nominated for 14 Grammy Awards, winning 3 times. When Elvis first met his future wife Priscilla, she was only fourteen years old. Elvis recorded 40 top 10 songs including 18 number one hits. His music and movies are still very popular. He made an estimated $55 million in 2012.